Looking for a memorable Tampa gift? We offer convenient gift cards for our sunset cruises and half day charters. 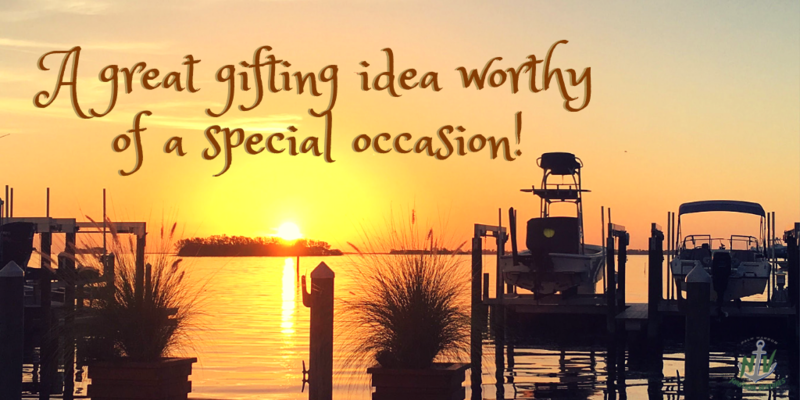 Whether you’re shopping for a birthday, anniversary, graduation, wedding gift, business contact, or “just because,” a Tampa Bay sunset cruise is the perfect gift for anyone who deserves a special treat. We offer personalized service for an unforgettable experience your loved ones will remember long after we’ve returned to shore. Located in the Palm Harbor (Ozona) area, guests will set out onboard our brand-new Ranger Tug with Captain Rich Smith at the helm. All our cruises all include a complimentary bottle of wine and the option to bring music to plug into our onboard speakers. The music and drinks combined with the sea breeze and salty air create a fun, festive environment for all. Gift someone the beauty of the Florida coastline, the thrill of being out on the water, and the luxury of unplugging and relaxing for a few hours. What a wonderful wedding, anniversary, birthday or graduation present! Your friends or family will bask in the beauty of a Florida sunset as they enjoy a complimentary bottle of wine or beer. Your friends or family will love the opportunity to spend four hours soaking up the lush Florida coastline. Perfect for Destination Dining, a Mini-Booze Cruise, or just a half day on the water, this cruise includes complimentary beer, wine, sandwiches, and snacks. If you need assistance purchasing your gift certificate, please give Captain Rich Smith a call today at 813-900-3224.